IN the last few years, our planet has thrived in the most disturbing uncertainties the world has ever known. Across continents, the human race contends with the realities of hunger and food crisis. From Al-Qaida in the Middle East to Boko Haram in northern Nigeria, peace continues to elude our world. At the heart of Euro Zone is a financial crisis that keeps nations awake at night, with its multiplier effect glaring at the sordid economic out-look of many Third World nations. With devastating earthquakes, tsunamis, hurricanes and untamed floods ravaging our communities, climate change continues to leave a bitter after-taste in our mouths. And then, with pestilence and nations rising against nations, we are forced to consider the dynamics of an inevitable Armageddon. Now, some folks term these permutations as signs of the times. Others simply opine it’s a reflection human excesses and the peril of capitalism. Some say we are back at the Hobbesian state where life was pretty brutish, nasty and short. But whether these postulations are valid or not is the basis of this narrative. But one thing is clear: We are thriving in one of the darkest hours in human history. Individualism, with its egoistic tinge, is fuelling the concentration of wealth and opportunities in few hands. In many societies, we witness the gradual annihilation of the middle class. As it stands, it’s either you are a rich fellow, rubbing shoulders with Mike Adenuga on the Island or a poor chap slugging it out in shanties and slums. You carry on with the wild hope that one day, the grass would go green. Days run into years and the miracle never happens. You end up impatient, bitter and perhaps devise curious measures of getting a fair crack of the whip. I remain a staunch apostle of capitalism for the singular reason that it encourages the development of talents and the creation of wealth. But in contrast, it lacks a human face; those empathic ethos that reminds us that we rise and fall together as a people. I agree with a columnist Brian Brown when he argued that ‘’the economic and financial systems can be reformed so the poor and struggling earn their daily bread yet retain some dignity in so doing.’’ We need compassionate capitalism to create an empathy society. Today, our society has lost its communal appeal. It was on that sense of community that our African traditional values were once anchored. A man could freely leave his wards in the sole care of a neighbour while he heads for the farm with his wife. Accounts from my grandmother revealed that giving was a fundamental virtue that thrived in these communities. But the story is not the same at present. Yet, there is a strong need to return to that communal culture of sharing and giving. That is the whole essence of an empathy society. It is a society that recognises social inequalities and seeks to make life meaningful for the seemingly disadvantaged. It is a society that demonstrates genuine compassion for brilliant kids whose educational pursuit is hampered by the claws of poverty or the ill-fate of deceased parents. These chaps are part of the society and so, they need our support, mentoring and encouragement. As a society, we can only attain true social cohesion when these sorts of persons are made to be part of the big equation. By so doing, we reduce the propensity of the youths to dabble into terrorism, armed robbery and violence. The empathy society is one in which people are not left to gnash their teeth alone, a society that shares in the travails of the vulnerable. Governments could create social security nets for the aged. Some of these old fellows served the nation in their prime. Some of them fought wars. Others were the Amazons of the Nigerian Civil Service that once worked. We must learn to reward and encourage such meritorious service. These are the building blocks of national rebirth. 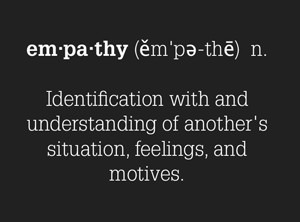 The empathy society is a culture where organisations genuinely practise corporate social responsibility. They don’t do it for selfish ends or the fringe benefit of mounting a billboard. We must grow beyond merely planting flowers in roundabouts. Like President Barrack Obama noted, the government cannot solve all our problems. It needs the partnership of organisations to achieve sustainable development. The reading culture in Nigeria is, at best, appalling. We need organisations that would stir our literary energy and contribute to the good of society. The Nigeria LNG is doing a lot in this regard. Fidelity Bank equally sponsors the annual writing conference that has seen the likes of Chimamanda Adichie impact on participants. Coca Cola and Nigeria Bottling Company equally sponsors Campus Life Project every Thursday on the pages of a national newspaper. That is a scheme that has inspired thousands of undergraduates across Nigerian campuses. We need more. We need an empathy society for morally vulnerable Nigerians. We do not have to abandon these folks hanging on to the law of averages. We could make them appreciate the blaze of the stars and the allure of heaven even if nature places them on the far earth. This is far from some utopist design. But we could ensure that those who work earn a decent reward doing so. We have to exhibit true concern for minimum Nigerians living a minimum life with a minimum wage. We don’t have to wait till the next flood rocks our communities. We don’t have to allow malaria and polio send our young children to their early graves before we swing into action. Perhaps, a little push, a little compassion. That could be all we need to build an empathy society. Seek the lofty by reading, hearing and seeing great work at some moment every day. For this is the only route to avoiding the menacing burden that afflicts the human soul! • Alasa is a 400-level Foreign Languages student of University of Benin.